A new bill may provide help in the fight against the fatal disease. The discovery of chronic wasting disease (CWD) in free-range whitetail and mule deer in Montana last November was met with swift and decisive action. Montana Fish, Wildlife, and Parks (MFWP) carried out two special hunts in December and January. They weren't aimed at eradicating the disease. Instead, the agency wanted to get a better handle on infection rates. Six mule deer and one whitetail tested positive. So far, MFWP has more questions than answers, including a critical one: How will the cash-strapped agency pay for CWD monitoring efforts? "We were fortunate to receive a grant last year through Pittman-Robertson funding for $1 million over the next five years, but that is a very small amount and unlikely enough to do what we feel is necessary," says John Vore, MFWP game management bureau chief. "What happens after that money runs out is unknown at this point." Thank the federal government for that. Soon after CWD started making national headlines, the U.S. Department of Agriculture pumped millions into monitoring and research efforts, providing as much as $18.6 million in 2006. That money was divvied up between research facilities and affected states, which tested tens of thousands of animals. Funding, however, was slashed to just $1.9 million in 2012. "My understanding is that once it was determined that CWD was not transmissible to humans, the USDA saw no need to keep funding monitoring and research efforts," says Kip Adams, Quality Deer Management Association director of education. The disease has been discovered in free-ranging animals in seven more states since 2012, including Iowa, Pennsylvania, and Arkansas, and is now found in at least 23 states and three Canadian provinces. "It is such a big issue right now," says Adams. "We should be spending more money on CWD monitoring and research, not less." No game species is more popular than whitetail deer and no animal has such a dramatic impact on local economies. And no game species is facing such an uncertain future as whitetails. Chronic wasting disease is showing up in new places, prevalence rates continue to increase, and recent research has shown the disease is responsible for declines in local populations. Nearly a third of adult bucks in at least one area of Wisconsin is infected. Similar rates were found in Arkansas. A Wyoming study showed that infected whitetails were 4.5 times more likely to die each year than uninfected deer. It's not just whitetails. An infected mule deer population in Wyoming is declining by 21 percent annually. Elk numbers in Rocky Mountain National Park are also showing increased infection rates. That's why Adams and others in the wildlife community are calling CWD the greatest threat to the future of hunting and conservation we've seen in our lifetimes. Deer hunters account for 83 percent of all hunters. They spent more than $21 billion in 2016, including $77 million on licenses, according to data compiled by the U.S. Fish and Wildlife Service. License revenue, along with federal excise taxes on hunting equipment, is the primary funding source for most state fish and wildlife agencies. If deer decline, so do deer hunters and as they slide, so will conservation efforts that benefit a variety of game and non-game wildlife. The disease is already diverting money and resources away from other game and non-game programs. Montana spent at least $34,000 to test 2,000 animals in 2017 alone. That was before the disease was actually discovered. And that didn't include manpower, supplies, and other expenses beyond the actual lab costs. "We have had to reprioritize some of our staff time, even within our law enforcement division, to deal with CWD," says Vore. "It is most definitely taking resources away from other programs in our agency." When the USDA stopped funding monitoring efforts, many states, including Montana, scaled back their surveillance programs, citing a lack of available money and manpower. There's a good chance the disease is in additional states, but without the necessary resources, managers may never know until CWD has already reached a point where containment may not be a viable option. "Adequate funding can help state wildlife agencies find CWD faster through regular testing and at least attempt to contain it before it gets out of hand," says Dr. David Walter, Penn State Cooperative Fish and Wildlife Research Unit assistant leader. "The more sampling that is done, the better we can track it and possibly contain it." (D-MT) introduced a companion bill in the Senate. The bills, crafted by the National Deer Alliance, QDMA, the National Wildlife Federation, and the CWD Alliance will dedicate up to $60 million for CWD monitoring and research. "Every state should be testing," says Walter. More money spent on research won't necessarily lead to a cure or even a dramatic reduction in infection rates. The disease is likely here to stay. However, more and better research certainly could lead to new discoveries to assist monitoring and containment efforts. "We need a practical live animal test, and we also need to develop a field test kit so hunters can check their deer on the spot," says Adams. "Hunters should have the tools to know if their deer is infected without going through a complicated process. We should not eat infected animals." That's not to say all research has ground to a halt. Scientists are continuing to study the disease, and many states still have active monitoring programs. However, a number of projects have been scaled back or sidelined. "There is a lot more we could do if we had more money," says Walter. In the meantime, researchers and state wildlife agencies are scrambling to find funds to combat CWD. Some states are using Pittman-Robertson money, which is raised through federal excise taxes on hunting equipment and divided among states based on the size of the state and license sales figures. "We basically have to apply for permission to use P-R funding for that, and we have to match 25 percent of what we get," says Cory Gray, Arkansas Game and Fish CWD coordinator. "It's not money in addition to the share of P-R funds we would have normally gotten, so in a way, the money we get through a grant is money that would have otherwise gone into our agency's general fund. We have to make a decision. Do we spend that money on CWD or do we spend it on other programs? We decided that CWD monitoring was important enough to divert some of that money." Gray says his agency established a research division and hired a veterinarian and a research biologist as a result of the discovery of CWD. "The money spent on CWD could be used for other things that are important to hunters and to conservation in general," says Adams. The Pennsylvania Game Commission (PGC) is using $300,000 of its P-R money to fund a study examining the impact of culling efforts on the spread of CWD. Walter's laboratory is collaborating with the PGC, which is providing manpower, deer capture supplies, and GPS collars, among other resources, for the research. Conservation organizations like the Mule Deer Foundation and the Rocky Mountain Elk Foundation have also provided funding, but they only have so much money to give. That's why Adams and others in the conservation community are urging hunters to put pressure on their representatives to pass the bills related to CWD funding. "If we aren't at a crossroads yet, we will be soon," says Adams. 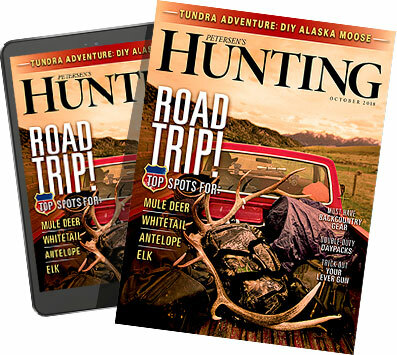 "The more we learn about this disease, the sooner we can start making informed decisions to protect the future of deer hunting."